The Tower of London The Tower of London dates back to 1078, though the main building has been added to over the centuries. The Tower has been used as a royal palace, a zoo, a mint (where money is made), a weapons store and a prison. 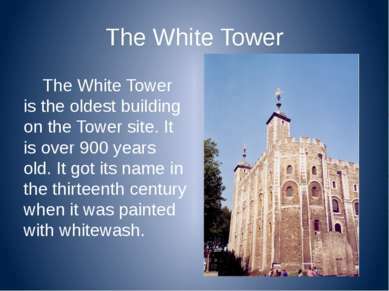 The White Tower The White Tower is the oldest building on the Tower site. It is over 900 years old. It got its name in the thirteenth century when it was painted with whitewash. 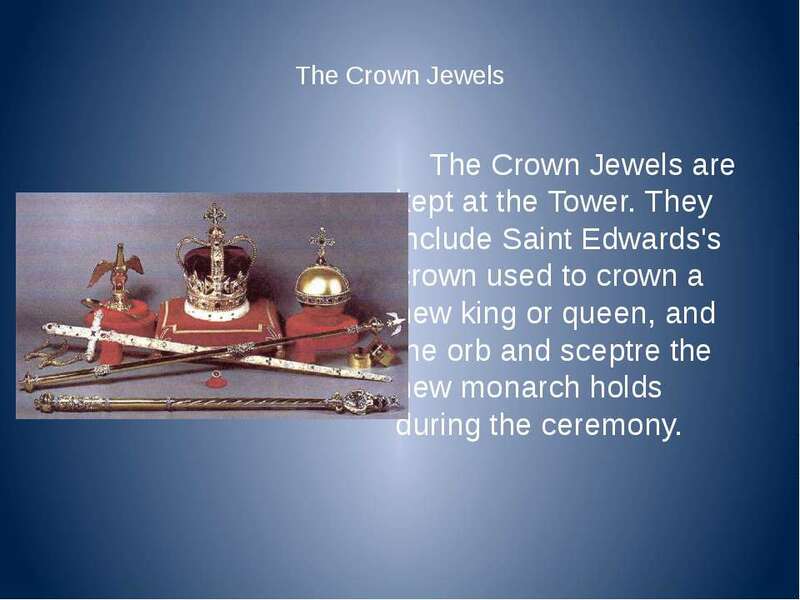 The Crown Jewels The Crown Jewels are kept at the Tower. They include Saint Edwards's crown used to crown a new king or queen, and the orb and sceptre the new monarch holds during the ceremony. 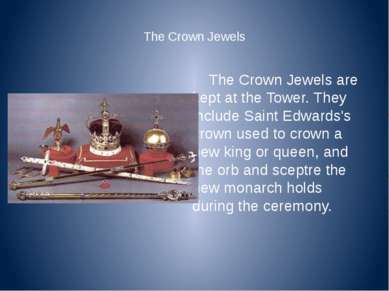 The Crown Jewels They are well looked after. Once they were stolen by a man called Colonel Blood. 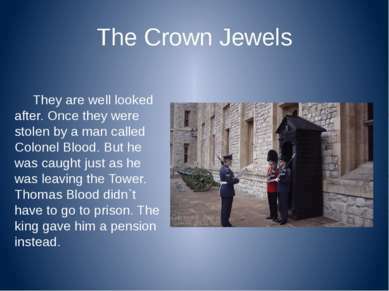 But he was caught just as he was leaving the Tower. Thomas Blood didn`t have to go to prison. 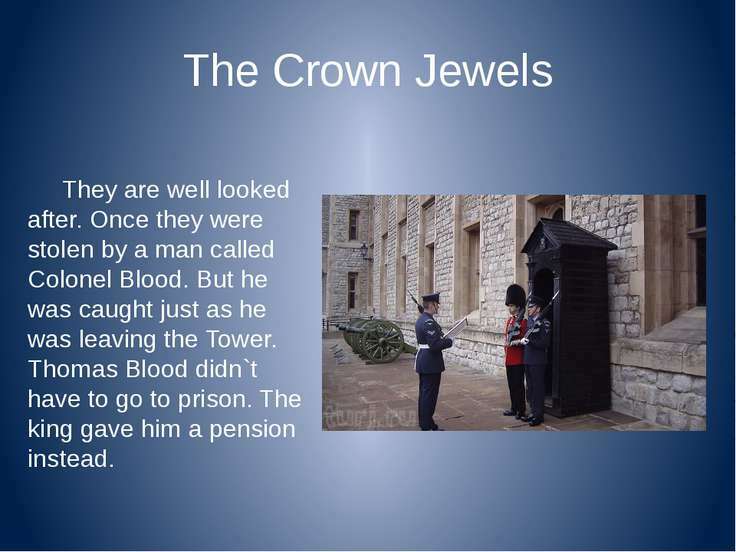 The king gave him a pension instead. The Tower Armoury The Tower Armoury was used to store suits of armour and weapons. You can still see suits of armour on display. 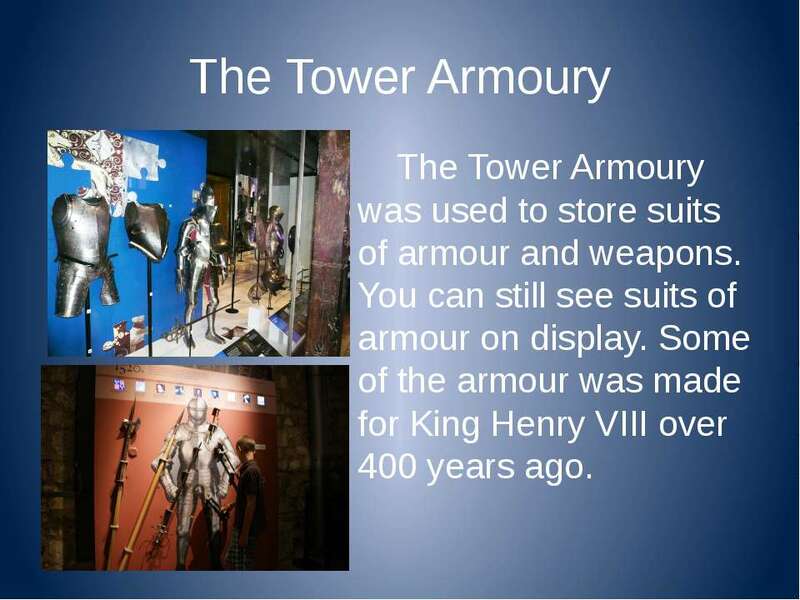 Some of the armour was made for King Henry VIII over 400 years ago. 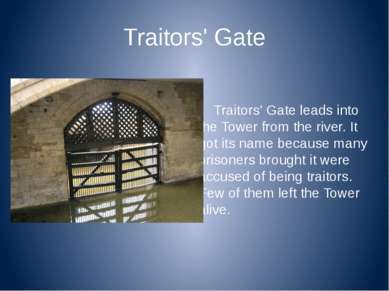 Traitors' Gate Traitors' Gate leads into the Tower from the river. It got its name because many prisoners brought it were accused of being traitors. Few of them left the Tower alive. 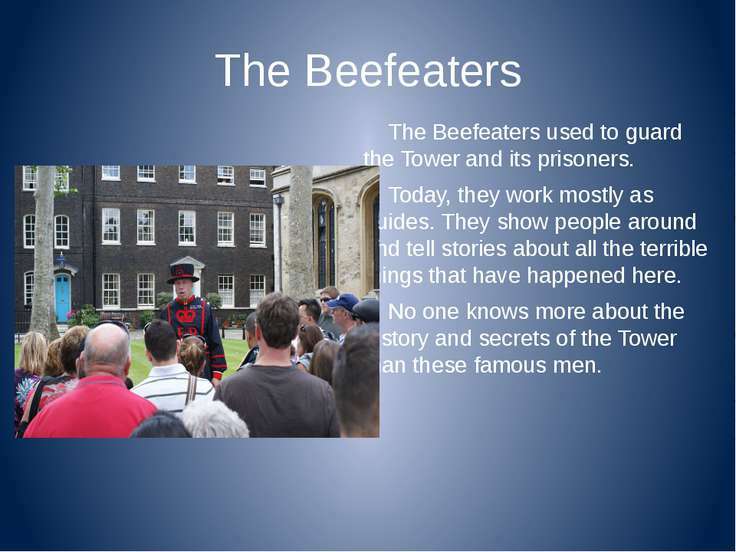 The Beefeaters The Beefeaters used to guard the Tower and its prisoners. 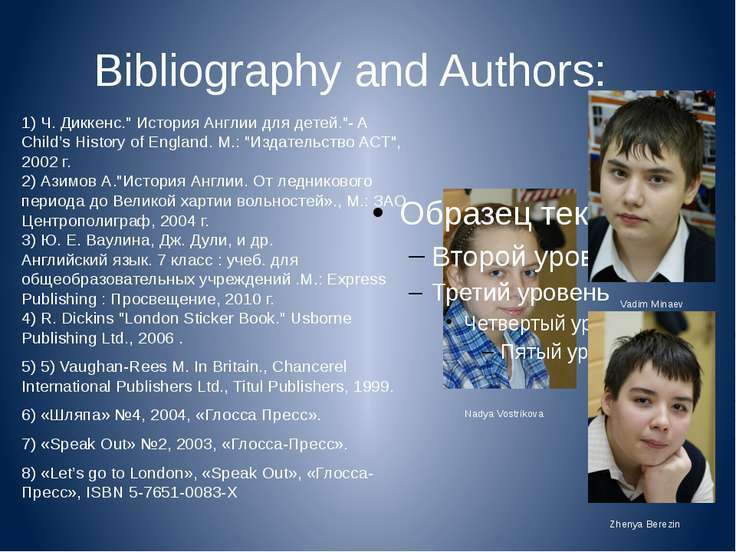 Today, they work mostly as guides. They show people around and tell stories about all the terrible things that have happened here. 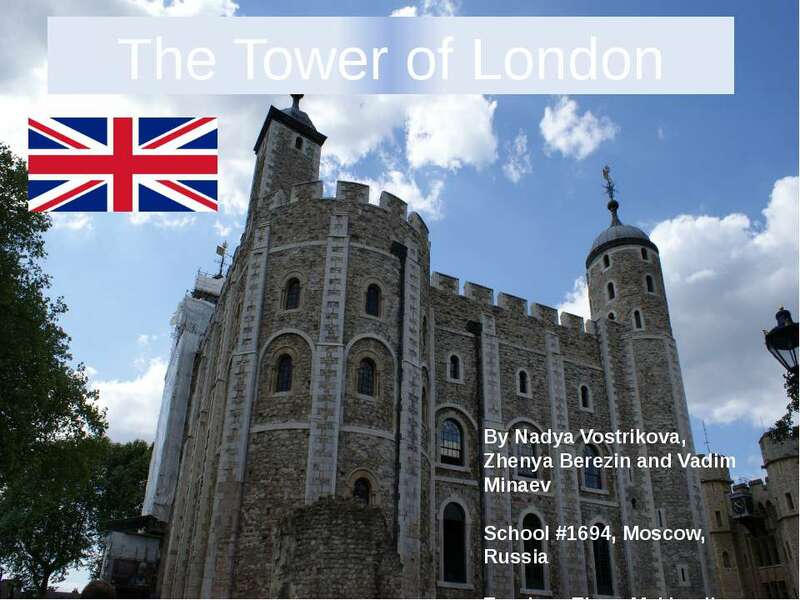 No one knows more about the history and secrets of the Tower than these famous men. 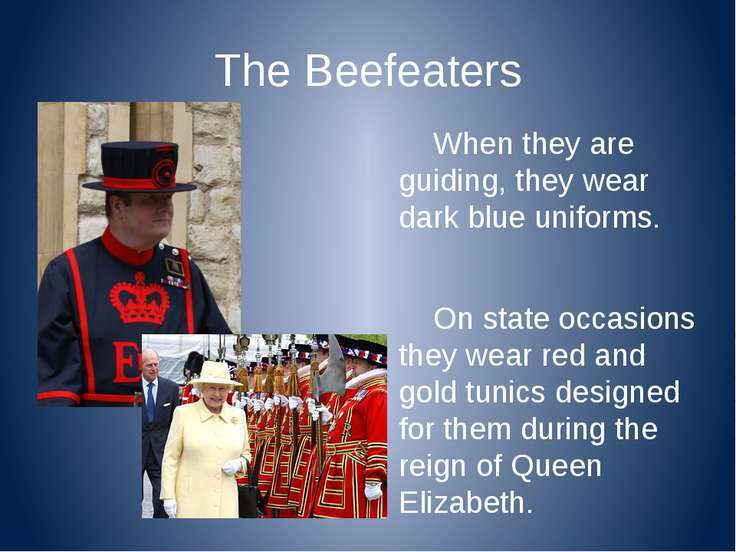 The Beefeaters When they are guiding, they wear dark blue uniforms. On state occasions they wear red and gold tunics designed for them during the reign of Queen Elizabeth. Ravens There have always been ravens at the Tower. The first ones probably built their nests here because they liked the old stone houses and walls. 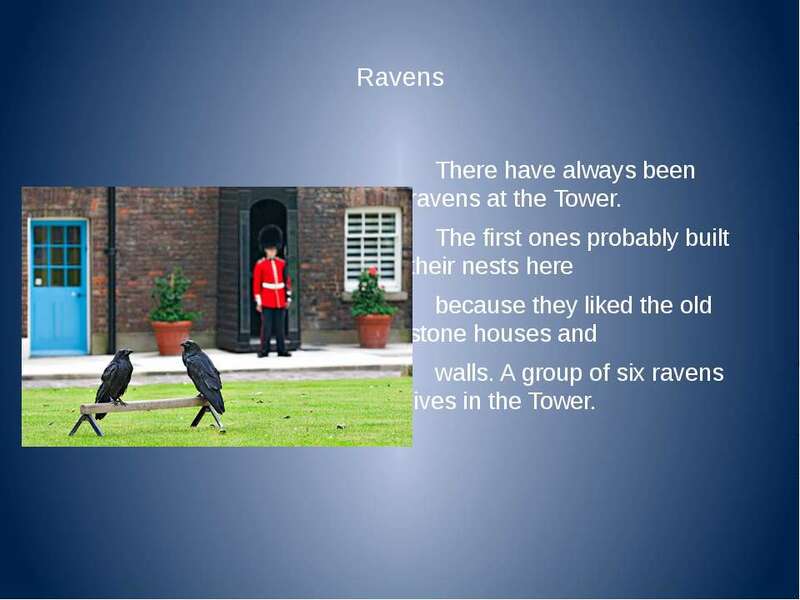 A group of six ravens lives in the Tower. 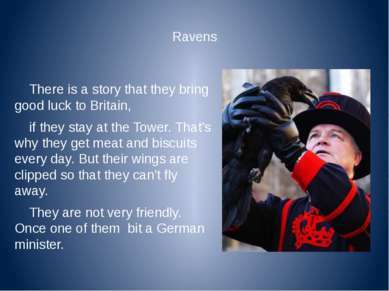 Ravens There is a story that they bring good luck to Britain, if they stay at the Tower. That's why they get meat and biscuits every day. But their wings are clipped so that they can't fly away. 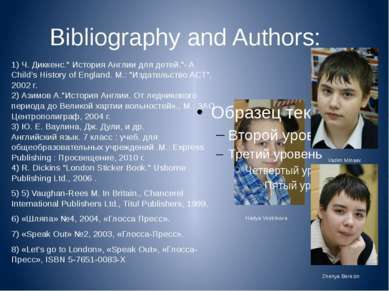 They are not very friendly. Once one of them bit a German minister. The Ceremony of the Keys "Halt! Who goes there?" "The Keys." "Whose Keys?" "Queen Elizabeth's Keys." "God preserve Queen Elizabeth." "Amen!" 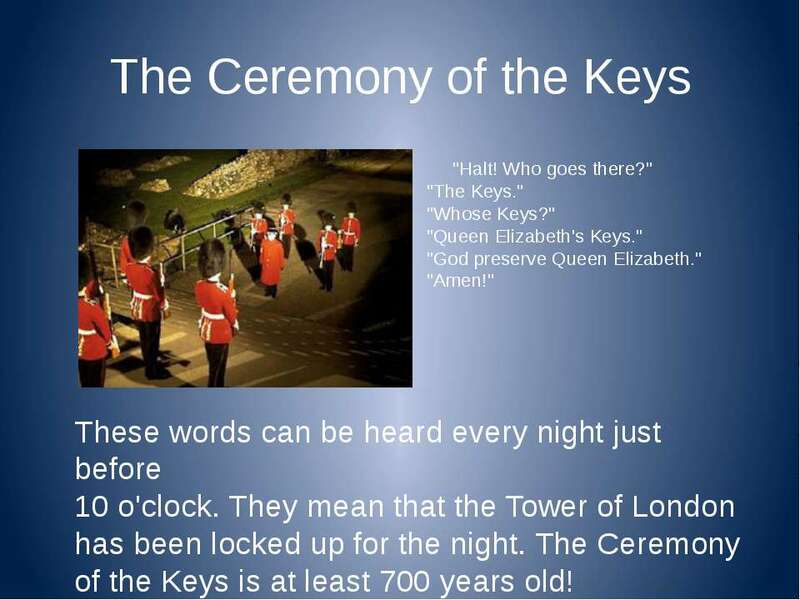 These words can be heard every night just before 10 o'clock. 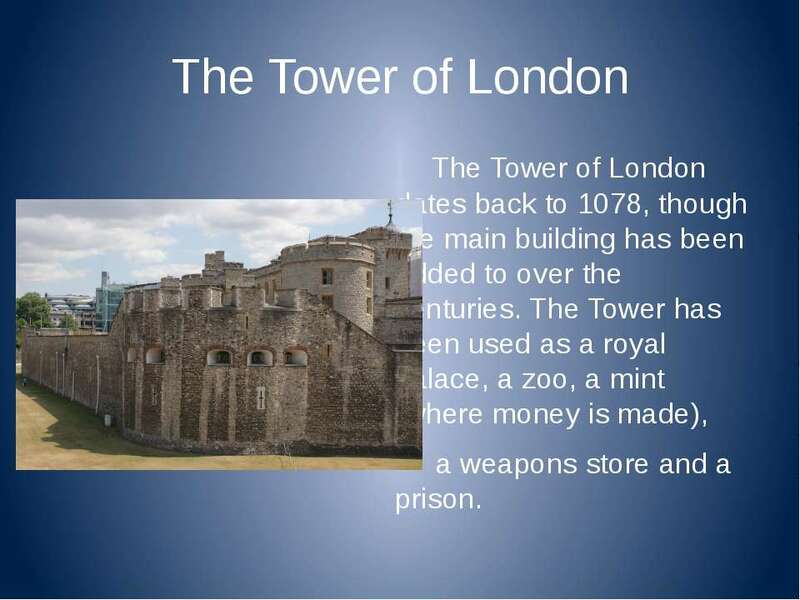 They mean that the Tower of London has been locked up for the night. The Ceremony of the Keys is at least 700 years old!